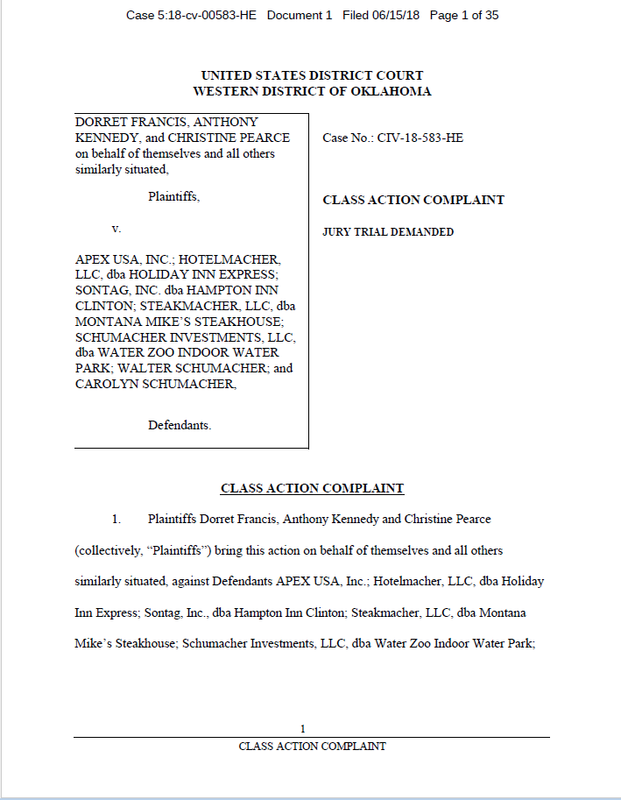 According to the Complaint, defendants Walter Schumacher and Carolyn Schumacher used a J-1 sponsor organization – APEX USA, Inc.– that they controlled and operated to recruit workers to staff the hospitality businesses they also owned and operated, namely a Holiday Inn Express, a Hampton Inn, Montana Mike’s Steakhouse, and the Water Zoo in Clinton, Oklahoma. The Complaint alleges that because the Schumachers controlled both the recruiting agency and the employer businesses, they ignored workers’ complaints of low pay, irregular hours, and inadequate housing, and caused them to believe that if they did not work exclusively for their companies they would suffer serious harm. The ACLU of Oklahoma is an affiliate of the American Civil Liberties Union, a national not-for-profit, non-partisan, voluntary organization founded in 1920. Its purpose is to protect those rights guaranteed by the United States Constitution and the Bill of Rights such as freedom of religion, freedom of speech, freedom of the press, freedom of assembly, freedom to petition the government for a redress of grievances, freedom of association, the right to privacy, the right to due process of law and the right to equal protection under the law. The Oklahoma affiliate was established in 1964 and opened its first headquarters in 1973. 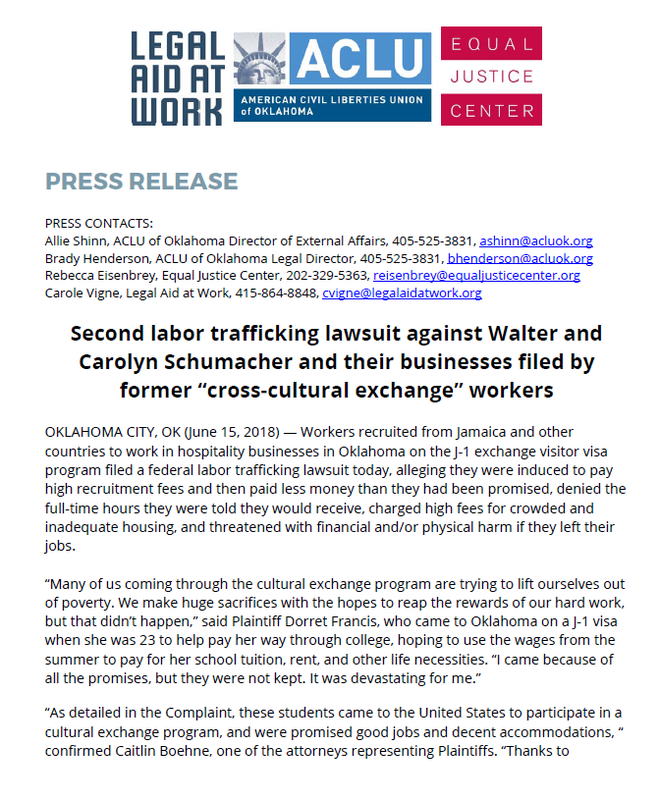 More information is available at: www.acluok.org. The Equal Justice Center is a nonprofit law firm and employment justice organization that empowers low-income families, workers, and communities to achieve fair treatment in the workplace, in the justice system, and in our shared society — regardless of their immigration status. The EJC provides direct legal representation that enables working men and women to recover unpaid wages and combat other basic injustices they encounter in their work, while working for policy changes and systemic reforms that protect and lift up the labor and human rights of both U.S.-born workers and transnational workers in our new global labor market. For more information, please visit: www.equaljusticecenter.org. Francis v. Apex USA, Inc.